Ready for Week 15 of the 52 Ancestors challenge? DNA is a powerful tool in genealogy research. What is a discovery you've made using DNA? What ancestor do you think can be found with genetic genealogy? Of course, you can take the prompt in other ways. Do you have an ancestor whose initials are D.N.A.? Participants who share every week can earn badges. If this is your first time participating, or you don't have the participation badge, please post here. Click here for more about the challenge. I have been hunting down ancestors and their descendants for a long time, DNA has allowed me to confirm every GG Grandparent, 19 GGG Grands and even a few GGGG Grandparents. In addition I have been able to add 100+ descendants, I never would have found so quickly as I have the last two years! I have an interesting DNA "discovery", altho it's not my own. My friend, Linda, who does my nails, is Vietnamese-American. Her mother, Lynna, born in 1972, is the daughter of an unknown Vietnamese girl and an American soldier. As soon as she was born, she was given up for adoption, and was adopted by a nice lady in her 60's. Eventually, Lynna married a Vietnamese boy, and moved to America, where Linda was born, along with 3 brothers. Linda has always known that she is 1/4 American, but it was always a "sore spot" with her mom, so they never really talked about it much. Her mom had been rejected and ostracized in Vietnam, because she was part American. Over time, Linda and I have talked about doing my family tree, and DNA etc, and she expressed some interest in finding out her heritage. But she knew that it would upset her mom, and she also knew that she could not keep a secret if she knew, so she wrote it off. But she planted the DNA "seed" with her mom, and it eventually took root. about 6 months ago, Lynna told Linda that if she really wanted to do a DNA test to find out, she would be OK with it. So Linda spit in the tube, and we sent it to Ancestry. Before too long, we had the results and she started getting matches. Almost immediately, we had a match for a 2nd cousin. So I wrote to the "match", who turned out to be a really nice and "receptive" woman, and who helped us sort out her tree to figure out who the "culprit" was. It turned out to be her mom's older brother, who had lived a rough life and had died just a month or 2 before we found him. That was a disappointment, but at least she knows his name, and that's more than she knew before. I was really shocked at the short length of time it took to identify him. That 2nd cousin match was really the key in making that connection. I'm sorry she lost her Dad before she met him, Lynn. But she has cousins! Cousins can be fabulous, and enrich your life in wonderfully unexpected ways. It sounds to me like she has at least one of those. Thanks Lynn for being such a good friend to Linda and an interesting DNA story. Laurie, I'm thinking she probably doesn't have any interest in that, but the door is open if she does. Thanks for sharing. I enjoyed reading the story. What a shame the father had died. In the early 1970's at university I knew a number of returning vets who were going to colleg on the GI Bill and the stories they'd tell would make your hair stand on end. Later in my working life I crossed paths with several Vietnames 'boat-people' (after the fall of Saigon) and their stories were equally harrowing. What was really haunting about both groups of people both US vets and Vietnamese immagrants was that neither group appeared to add embelishment to their tales.. The Viet Nam war was so horrifying neither group felt the need to embelish reality. I'm glad your friend was able to locate her father even if in name only. When I started getting into genealogy only about four years ago, I only looked at direct ancestors and tried to get as far back as I could. Fortunately a distant cousin that understood a great deal about DNA contacted me. He took me in a different direction. From him I found out about my Long family. I learned about Seymour Edward Long https://www.wikitree.com/wiki/Long-14421# my great grandfather’s cousin that married Maryann Forepaugh and how the family all worked for the Forepaugh Circus. I feel that I have only touched the beginning of what DNA will be able to find. So in addition to the vaudeville dancer, you have CIRCUS PEOPLE???? DANG!!! How come *I* get all the BORING ancestors???!!!! We are from the McCulloughs, and that got us a DAR ancestor! Looks like I could not have gotten in any other way. What is a discovery you've made using DNA? None. I haven't done anything with DNA. What ancestor do you think can be found with genetic genealogy? Never even gave this a thought beyond: "I'd be curious to know if I have any Neanderthal DNA". Of course, you can take the prompt in other ways. Do you have an ancestor whose initials are D.N.A.? Nope .. and I looked! My non-answers still count as participating! That was the biggests surprise for me when I read my test results, Melanie, that I could have any measurable Neanderthal DNA after what, 400 generations? Reading about it also changed my mental image of Jondalar, but I've moved on. There is a Paul yDNA project on FamilyTreeDNA.com: https://www.familytreedna.com/groups/paul/about I suggest that you ask one of your brothers to do a yDNA37 marker test to find genetic cousins on your paternal line of forefathers. For the Neanderthal DNA, you can take an autosomal DNA test from 23andme.com. This is what they say about my autosomal DNA test, "You have 327 Neanderthal variants. You have more Neanderthal variants than 98% of 23andMe customers. However, your Neanderthal ancestry accounts for less than 4% of your overall DNA." Explains a lot. . . I have a story that is more like a puzzle than a breakthrough ... but you never know! You see, there's a woman in Ireland who discovered me through DNA. We share a big segment of chromosome 9. The only problem is that our ancestors are separated by an ocean, and a couple of centuries. She advised me that her ancestors didn't come to North America, ever, and I'm certain that my British ancestors left the UK a long time ago - my DNA map actually points to Puritan New England as a place of origin, and I only have 2 brickwalls before the year 1800. Clearly one of us is missing an ocean voyage, right? Sharing family trees, we found just one name in common, this one: Simon Giffin. Seven generations and nearly 300 years back. Her Simon wasn't likely the same man, but the Scots-Irish had strong naming patterns, and its our only possible connection. Seven generations! I have something like 128 ancestors crowded into my little strands of DNA at that generational distance, and none of them have any business leaving statistically significant segments lying around. But the fact remains that this woman in Ireland and I share a big segment of chromosome 9, and only one clue. So far, nobody else matches with either of us on that same segment, but the next person who does could help solve an interesting puzzle. Have you had your test done? I found a confirmed match of a large segment of DNA from a 6th cousin in the Netherlands. I've always found it fascinating how far that piece has made it all the way to both of us. I learned in my late 50s that the man my mother told me was my father was not. She took this secret to her grave. I only found out due to a family argument (naturally!) Then the DNA testing began... first with three brothers on my maternal side, which proved they were full brothers to each other and I was a 1/2 sister to all three. I'm sandwiched in between these boys, so that was quite a revelation for all of us. Afterward, my mother's baby sister, my aunt, and my eldest 1/2 brother tested at Ancestry.com, 23andme.com, and FTDNA.com so I could weed out maternal matches. It took three years of DNA training and learning to be a genealogist before I finally found my paternal relatives. I used a reunion agency to contact one of my possible paternal sisters, and after a short while, she agreed to a DNA test. When the results came back I had my proof. I gained just as many siblings on my paternal as I had on my maternal side, so my siblings doubled! I am so much more like my paternal siblings that, when we all met, I felt like I'd known them all my life. DNA is strong! It has been wonderful to know which family I belong to, and that has helped me reconstruct my identity. Of course, the medical information has been invaluable for me, my children, and grandchildren. Getting the history on my bio father and his parents, and up that line has been so interesting! I'm sure I've completely bored my maternal siblings with all the facts... and they try to look so interested. :-/ Bless their hearts! I've only just recently gotten my DNA test results back, but have really enjoyed seeing the benefits of it. My father was the very last of his generation, and in an unexpected twist, was nearly 60 when I was born. This has made it interesting to see the oldest relatives I can confirm with DNA. So far the oldest has been my great-grandfather, William Stoker Edwards, born about 140 years before I was. One day I hope to officially connect this ancestor, Abraham Onions to his paternal line with the help of DNA. Do Not Ask. I'm totally enthusiastic about DNA but still awaiting results from the WGS that I did with Dante Labs. I'm sure there will be a few revelations when it finally arrives. As a result of Douglas Beezley's work with Y-DNA and the "Beasley/Beezley" surname and the documents we found, he was able to help me determine that Kindrick Beasley, not Isaac Beasley, was my 4th great-grandfather which opened up that whole line back for many generations. So, ladies, just because you don't carry a Y-chromosome, Y-DNA studies can still be of use to you if you can work the paper-trail back to a male line which has been confirmed by Y-DNA. My gg grand father Robert Hawkes https://www.wikitree.com/wiki/Hawkes-821 was illegitimate, born in the St George the Martyr Workhouse, Southwark. There is a possible candidate who could be his father, but it will require a DNA match to resolve the mystery. I didn't do DNA-test, but I have a little anecdote though. One of my first cousins once removed looks so much alike his son that everybody in the family really has to look carefully on pictures to see if this is father or son on the picture. When the little one was shown a picture of his father (when the father was about 2 years old) and asked: "Do you know who that is?" he answered: "This is me when I was small!" Btw: I participated in all challenges this year, but still didn't get a sticker for my profile. I saw others have that already. 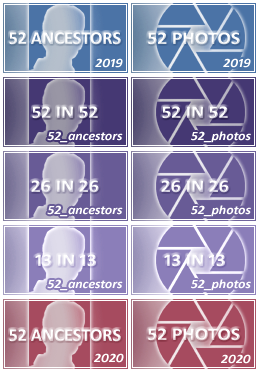 If you have done 13 weeks in the 52 ancestors and/or photos challenges, you have to ASK for the badge, Jelena. Contact Eowyn and ask her. Thanks Robynne, I pmed her. DNA allowed me to identify the previously unknown father of my great grandmother, Bessie Morgan (Morgan-3035) as Presley Stutts (Stutts-206) My great grandmother died before I was born but all of her grand children advised she never knew who her father was. I'm hoping to use DNA to also determine the unknown father of my 2x great grandmother as well. But, the basic jist is that I used a combination of DNA and traditional genealogy to identify the parents of Caterina Coppola and her siblings who came to America. I compared DNA matches of my great-aunt, my dad and myself to people who had each Coppola sibling in a tree. Then I contacted one and she believed the parents were Paolo Coppola and Rosa Suverato. I e-mailed the commune office and had it confirmed. One person I really need DNA connections for is my brick wall. We talked about her last week. I recently did a full sequence mtDNA test. I haven't learned anything from it yet although I am glad to know my haploGroup. I did find a new 5x great grandfather using the ThruLines feature at Ancestry not long ago. I would like to do more with my DNA test results then I have done so far...maybe after I retire. My 6th-Great Grandmother Lucy (Thompson) Skaggs, b. 1742 (https://www.wikitree.com/wiki/Thompson-12774) was claimed by many descendants to be a full-blooded Native American from Georgia. This always seemed suspicious to me, and much more so after the publication of an extensive Diary belonging to her brother, Archibald Thompson, which gave no indication of any native family connections. I was able to prove that neither Lucy, nor her mother, were of Native American extraction when I tested the full Mitochondrial DNA (mtDNA) of a matrilineal descendant, Barton Musick. That test proved Lucy's mtDNA Haplogroup to be U5b2b3a1, which is absolutely of European origin. Since that first test the mtDNA haplogroup of at least two other matrilineal descendants has been elucidated by 23andMe, verifying the initial test result. This legend of Native American ancestry dies hard, with some descendants refusing to believe the science. However, those who understand the science of DNA know that Lucy Thompson was not of Native American extraction. Q.E.D. Getting a DNA test is the reason I became involved with WikiTree. One of your members, Alan Sims, found me via my Ancestry.com DNA results. He encourage me to join the WikiTree challenge. I have so far added many of my family members to the tree. I have many more to add as I feel comfortable with my sources. My brother in law had his DNA tested. The paper trail led us to ancestor, Willem Bennett who was an original purchaser of Brooklyn NY for the Dutch. The DNA was consistent with other descendants of Willem. But what my brother in law really wanted to know was: Where were Willem Bennett and his ancestors from? Holland, England, French Huguenots, a current theory seems to be Denmark. Unfortunately, the DNA did not answer this question, for him. I have not done anything with DNA yet. I am still working from a basic document perspective. I see that DNA may be useful for tracking immediate ancestors. I have some concerns about using DNA for tracing % of ancestors from certain geographic areas. I am not sure that the data in the commercial databases is sufficiently well defined for that information to be accurate. I thought for the longest time that I was a branch of Clan McDonald with the McDaniel Surname. However the new Y-DNA testing showed that my extended family is strictly from Ireland and that the surname was modified from McDonough to McDaniel at some point.